Players are not allowed on the courts without the proper court or running shoes. Sandals, street shoes or bare feet are not allowed. It is important to purchase good quality court shoes if you intend playing for a long time. b) Call 'Ball On Court"
If a ball rolls onto your court during play, stop the game so that the ball can be removed and then replay the point. find out who's missing their ball and throw or hit it back (in the air) to a player on the court from where it came. It is dangerous to walk behind a court where play is going on. You could step on a loose ball, or be run into by an unsuspecting player chasing after a ball. This is also discourteous as you may be distracting players. Wait until the play is finished before walking behind the court. d) DO NOT RUN BACKWARDS! easy to trip and fall, banging your head on the court, or hurting your wrist or arm. Always drink some water after each game to avoid dehydration. Kenetic moves are used to warm up your muscles. A fast walk or a cycle ride to the courts, running on the spot, side stepping 10 steps to the left, then 10 steps back again. Swing your arms forward and backwards, and for your back- stretch high, then touch your toes many times. Cool down stretches are best done after playing to prevent stiffness in muscles and getting your body temperature back to normal again. is located just inside the main entrance to the arena on the right hand side of the hallway, next to the main office. ​The instructions for use are contained on the unit. ​ the picture on the right to see if you can save someone's life! 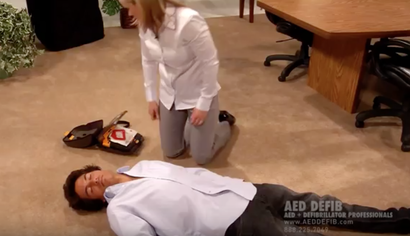 ​In this video, watch AED DEFIB's Medical Director and M.D. demonstrate how to use the Physio-Control LIFEPAK CR Plus AED. For more information on the LIFEPAK CR Plus and to learn how you can best prepare to save a life, please visit us online at http://www.aeddefib.com. ​We’ve all walked by the Red Cross sign in airports which indicate where a heart machine is located. Do you know what is in them and how to use it? Try this video and see what you think. If you pick the wrong choice----the man dies----choosing wisely may save a life. CPR Saves Lives and anyone, you too, can do Hands Only CPR. We have heard multiple stories of how CPR and AED’s have saved the lives of pickleball players. This simple 60 second video shows you how to do Hands Only CPR. 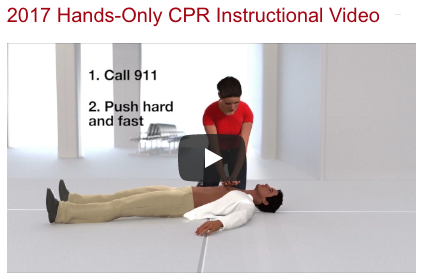 It is an official Hands-Only CPR instructional video from the American Heart Association http://www.heart.org/handsonlycpr. Remember, if you see a teen or adult collapse, call 9-1-1 and push hard and fast in the center of the chest to the beat of the classic Bee Gees’ song “Stayin’ Alive.” The American Heart Association’s Hands-Only CPR at this beat can more than double or triple a person’s chances of survival. Your pickleball committee wants to stress​​ the importance of safety ​during your playing sessions. If someone should have an accident, please be aware that the Town of the Blue Mountains needs an incident report to be filed with them detailing the accident. Copies of this incident report can be found in the Pickleball manual that is at the back of the hall, in the red binder on the table. Once the incident report has been completed, please put it in the red basket to be picked up by a committee member. to get information you may require about the game, including drills, that you may want to practise during the allotted time. An interesting article from PAO member, Joseline Sikorski. She and many other players, including our own Jackie Johnstone (below) wear eye protection on the courts. <-- here (click picture) to find out why and check out an interesting article from Sunnybrook Health Centre on the importance of protection. Every year over 600,000 recreational and sports related eye injuries occur. Of these close to 14,000 result in a permanent loss of sight. Racket sports rank 4th among activities causing eye injuries. About 90% of these could be avoided with the use of protective eyewear made of polycarbonate lenses. Polycarbonate lenses are highly impact resistant and are available in prescription and non-prescription lenses, and they offer UV protection. A change or loss of vision causes a significant lifestyle change, and has a social and financial impact. Pickleball is classified as a high risk activity because it involves a ball and a paddle, both of which can potentially cause eye trauma. Blunt Trauma; This is when an object strikes your eye, and is the most common injury. This can result in orbital fractures, a ruptured globe (broken eyeball), a vitreous hemorrhage, or a detached retina. 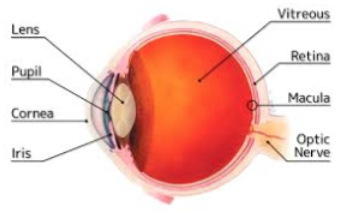 The retina is the posterior part of the eye sensitive to light and creates a visual image, similar to the film in a camera. Penetrating Injuries; This is when something cuts your eye, it is very rarely seen in racket sports, unless eyeglasses are broken. Radiation Injuries; This is caused by exposure to ultraviolet radiation from sunlight. Excessive exposure to UV light can cause eye damage, including cataracts, macular degeneration and temporary vision loss. The closer you are to the equator and the higher the elevation, the greater the UV exposure. From 10:00 a.m. to 2 p.m, UV exposure is greatest and certain medications such as tetracycline, sulfa drugs, oral contraceptives, diuretics and tranquilizers increase exposure. A pickleball can travel at one third the velocity of a tennis ball, which means it can travel at about 40 MPH. With two players at the no volley line it takes 350-400 milliseconds, or less than half a second for the ball to travel from one paddle to the other. In other words you do not have time to avoid being hit in the eye with a ball. You can test your reaction time at this website. http://www.mathsisfun.com/games/reaction-time.html . In addition to injuries from being hit by a ball, serious damage can occur from being hit in the eye with a paddle. If you do suffer eye trauma playing Pickleball, see an Opthomolgist immediately if the injury results in a loss or change in vision, significant pain, bruising or bleeding. See the pickleball even better with these eye-saving glasses. The lenses are made of a shatterproof polycarbonate, And they offer UV protection. can be found in the blue bin always in full view when players are on the courts. ​Ice/cold packs can be found in the walk-in cold room just off the kitchen area.